South by Southwest may have downsized since reaching critical mass a couple of years ago, but it’s not as if it has returned to its roots as a modest music conference in a sleepy college town. Austin isn’t that town anymore, and that version of SXSW is never coming back, but there are fewer big-name headliners, and some corporate-sponsored staples of recent years (like the Spotify House and the Fader Fort) were either entirely absent or greatly scaled down in 2017. Rest assured, however, that SXSW still permeates a huge chunk of the city during Spring Break, and there’s still plenty to see and do. For those of us who live in Austin and watch it transform gradually over time, one entertaining and potentially confusing aspect of SXSW is the funhouse makeover our city gets during this week in March. 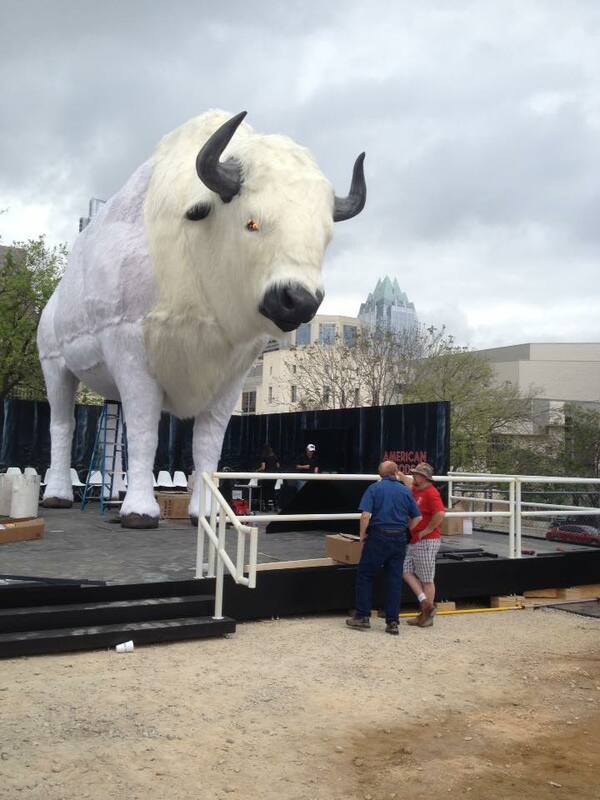 Suddenly that vacant lot you never give a second thought is home to a 30-foot, smoke-breathing white buffalo. 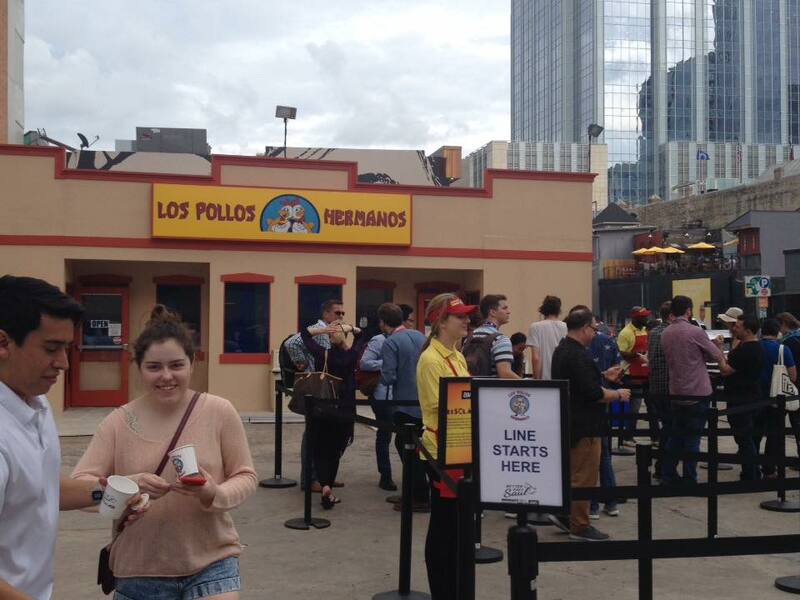 Feeling hungry, you might decide to check out the chicken joint you never noticed before, only to realize it’s Los Pollos Hermanos, the fictional restaurant from Breaking Bad and Better Call Saul. 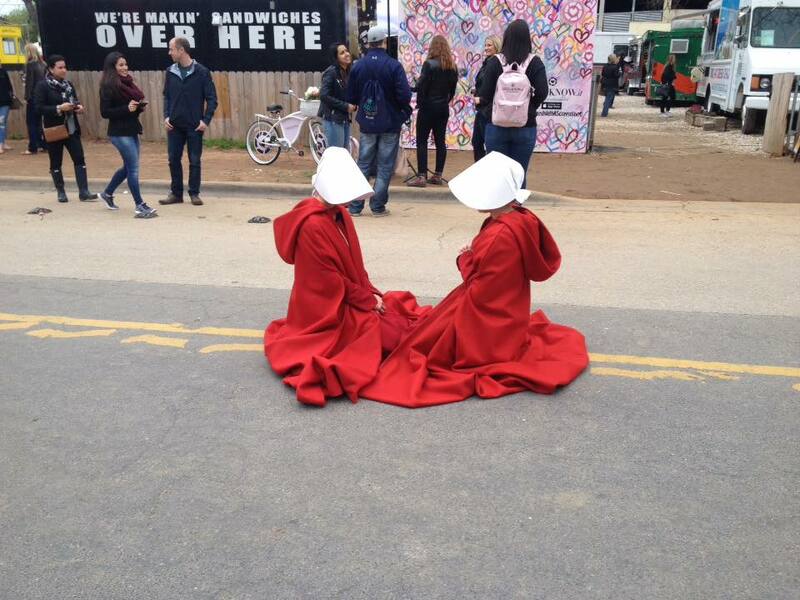 And who are these creepy women in long red dresses and white bonnets wandering down Rainey Street? If you hadn’t seen any publicity for Hulu’s The Handmaid’s Tale, you might have no clue. This is a kind of virtual reality, but the more technical variety was also on display at the JW Marriott, where badgeholders donned goggles and headphones to dive deep into alternate worlds, like the shimmery surreal landscape of The Giant from Mike Anderson and New Media Ltd.
Panel discussions at the convention center aren’t necessarily SXSW’s primary source of big laughs and good times, unless you get a kick out of topics like “Collaborative Innovation in the Digital Health Age” or “Fitness and Fashion: Creating and Scaling Lifestyle Brands.” One major exception this year featured nearly the entire cast of Veep (including Julia Louis-Dreyfus, Gary Cole, Tony Hale, and Anna Chlumsky) promoting the HBO comedy’s upcoming season. 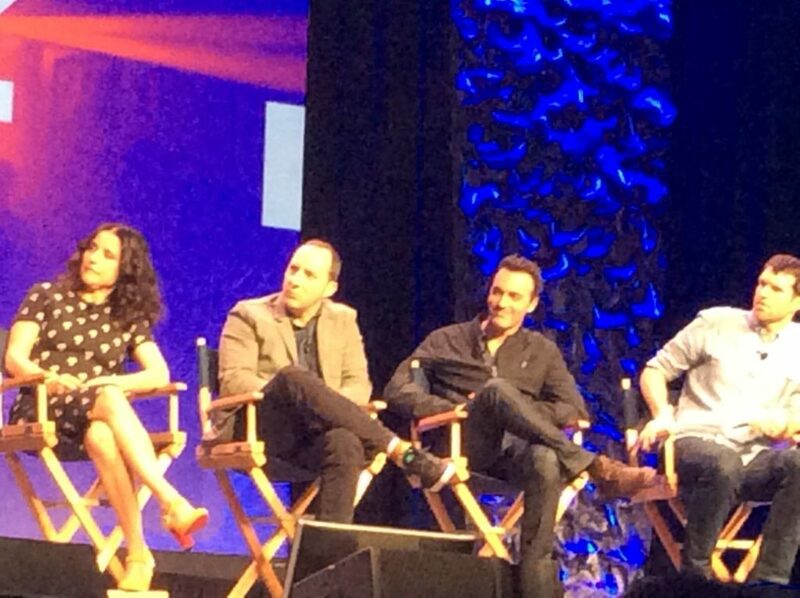 Moderator Chuck Todd wasn’t a great fit, too focused on the reality of a Trump world that doesn’t exist on the show, but the cast and showrunner David Mandel left Todd in the dust with their rapid-fire quips and anecdotes from the set. The hardest part of doing the show, Sam Richardson asserts, is not cracking up in the middle of a scene. As for run-ins with real-life counterparts in Washington DC, Timothy Simons makes it clear that no one ever claims to be the Jonah. Comedy has become a bigger part of the SXSW experience in recent years, with nightly showcases taking over the stage at venerable Austin institution Esther’s Follies. This year was no different, with the Laugh Button Live and Gotham Comedy Club teaming up to present a particularly raucous and raunchy showcase hosted by Liza Trayger. Performers included Louie’s Robert Kelly (who required help from audience member to zip his fly), seasoned vet Rich Vos, and “secret headliner” Al Madrigal. The only drawback for those of us trying to spend SXSW in a Trump-free bubble was the political humor, but how could any self-respecting comedian be expected to avoid such a fertile vein of hilarity? Before SXSW begins, it’s important to have a plan of attack. Make a schedule, include back-up plans, and account for time and distance between your must-see events to ensure you don’t miss the things you really want to see. But it’s also important to leave one day open for drifting. Thursday is usually the best bet, as the music portion of SXSW is in full swing, meaning the streets are lined with day parties offering free music (and sometimes free beer). There’s always a chance you’ll discover your favorite new artist, which happened for me at Hotel Vegas when Aldous Harding took the stage. Looking like Chrissie Hynde transported from the early ‘80s, Harding defied all expectations with a daring performance style of arresting—sometimes frightening—intensity. At times the New Zealander recalls Bjork, Kate Bush, and the Velvet Underground and Nico, but her oddly-accented voice is uniquely her own, and dramatic, spellbinding songs like “Party,” “Horizon,” and “What If Birds Aren’t Singing, They’re Screaming” conjure a dark, Lynchian vibe. Promotional pop-ups for upcoming television seasons rarely draw as much as interest and excitement as Showtime’s Twin Peaks Lodge, which took over the Clive Bar on Rainey Street for two days and nights. 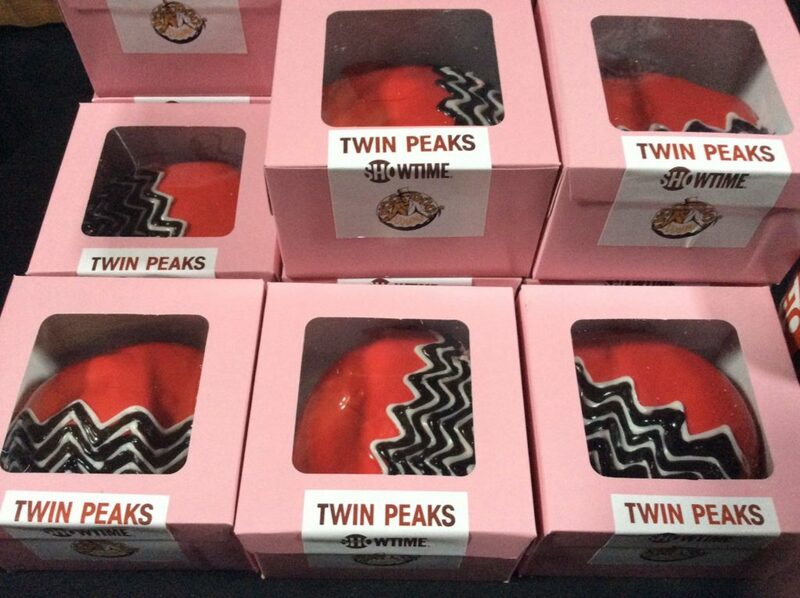 Rumors that a trailer or some new footage might be screened proved unfounded, but the site still offered plenty of treats for Peaks freaks, including: a replica Double R Diner serving coffee and cherry pie; plenty of merch and music (including, appropriately, a set by Aldous Harding); donuts decorated Black Lodge style; and even a deer head on the bar next to a fish in a percolator. Special Agent Dale Cooper himself, Kyle MacLachlan, made the rounds and introduced headliners Real Estate, slipping in a reminder that Twin Peaks returns in May. Few needed reminding, but that’s the SXSW formula in a nutshell: two parts fun to one part hustle.